The Pro-Lite Verona is a full alloy racing wheelset with asymmetrical hub, which despite being asymmetrical, is still perfectly balanced. The purpose of the hub directly addresses the imbalance that is normal in every dished wheel that has a larger diameter flange. More dish can result in better lateral strength, which helps cyclists when they are pounding the pedals out of the saddle, however, increasing the offset will also result in a decrease of tension and this makes wheels much more susceptible to fatigue and also reduces their durability. Having spokes that are shorter means that there is less chance of spoke breakages when at higher tensions and this means better lateral strength so you will be able to push a lot harder. The Pro-Lite Verona’s spokes are Straight Pull and Aero type which means that they have a longer fatigue life and increased strength. Having a large flange on the non-drive side allows a higher tension to be used and also compensates for the imbalance that’s introduced by the need for cassette space. 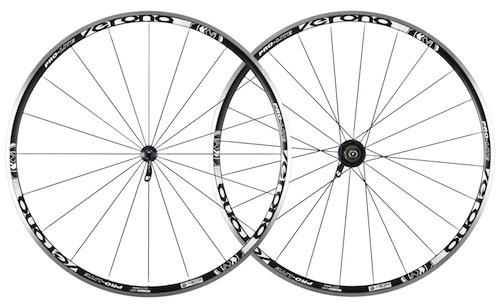 The Verona Wheelset has sleeved alloy rims that measure a depth of 25 mm and with wheels weighing in at 670 g (front) and 964 g (rear) the total wheelset weight is pretty practical for cyclists looking for racing wheelset that is also reasonably priced.